The hand engraved titanium M1000 Monarch is a superb pen, the engraved Monarch is a good looking pen in pictures, but in the hand.... It's breathtaking. It's one of the only pens I have ever photographed that actually looked better the closer up you got to it. The artist who did the work, Adone T. Pozzobon, was kind enough to share with us a little bit about the work that went into creating this pen. Adone is a well known engraving artist, born in northern Italy, he moved to Canada at a young age, and following in his father's footsteps, became an accomplished artist. He has a background in many different art forms, all of which he credits towards broadening his skills as an engraver. 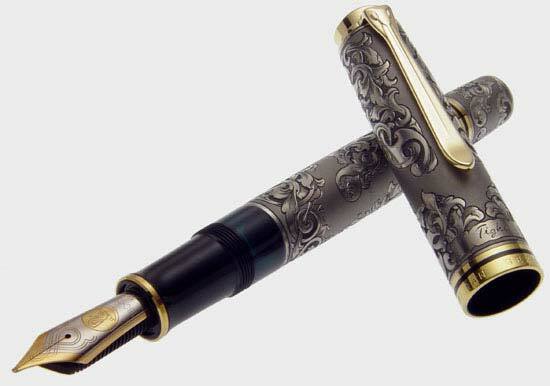 As a master engraver, he has done work on custom knives, firearms, jewelry, and now, fine pens. "Fine quality hand engraving is unlike any form of machine engraving and certainly bridges the gap between the cast, die stamped or laser engraved embellishments. 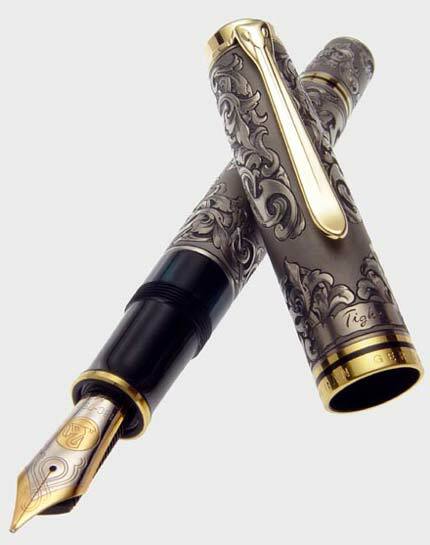 A custom one-of-a-kind hand engraved pen is unique in many ways, first and foremost it is not only an engraving, it is an artistic creation beginning with a unique design painstakingly implemented to accent the elegance of any fine writing instrument. Beyond the initial design concept and its preparation the artist must now begin to execute the 2 dimensional theme onto a 3 dimensional canvas and must contend with the radical radius of this medium." That this pen is truly a work of art is obvious, but what might not be so obvious at first glance is the fact that the design was carefully created to harmonize with the shape and size of the pen. It's not just a matter of slapping some pretty swirls on the cap and barrel! Grayson Tighe's work is evident on this pen, to begin with, it's not merely an overlay on an M1000. Not that there would be anything wrong with that, necessarily, but instead of simply putting a payer of metal over the cap and barrel, Grayson first machines down both the cap and barrel, so that when the overlay is fitted, the resulting diameter is the same as the original plastic pen. It's a small touch, but one that shows the level of attention to detail that has become Grayson's hallmark. This makes the pen very usable, it's no larger, and only slightly heavier, than an unaltered M1000. "One of the most difficult aspects of engraving is the clean execution of the engraved image. Considering that the decoration is a freehand line per line operation it quickly becomes clear that precision must not only rest in the hands of a well-versed artist but also within the mind and soul. If we strip away these inner sentiments it becomes easy to short change ourselves, as the task is long and arduous. The achievement of exhibition grade standards should never be taken lightly. It is this essence that delivers the unique flair and professionalism demanded by the finest of collectors." 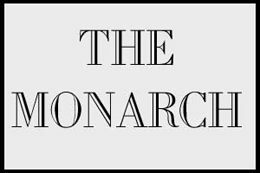 "The 'Monarch' personifies these sentiments as well as establishes the classical fortitude in traditional elegance. Richly embellished and elegant in its design the 'Monarch's' engraving captures the very essence of the Renaissance era and is carefully fused with the graceful Victorian style, yet maintaining a fresh modern sophisticated appeal." "The tonal contrasts are created using the 'bank-note style' shading technique, and this represents the bulk of the image impact representing light to dark tones. This technique is considered as one of the most difficult forms of shading as it requires extreme precision of each micro line, and is performed under a microscope at around 20x power. Grouping these individual lines must at all cost be precise in order to maintain tonal continuity throughout the entire work. A single 3/8" leaf may contain more then 100 individual micro lines. It quickly becomes clear that upon completion a pen engraving with extensive coverage will contain literally thousands upon thousands of shaded lines." "The 'Monarch's' engraving is also in relief, meaning its backgrounds (between foliage, vines) have been cut away to precise depth and smooth and evenly leveled by hand. To accent this background thousands of individual lines are once again produced one at a time, however they are not of the same nature as per the aforementioned 'bank-note' shading. In this case a different contrast is designed. Using very specific angles for each line a sparkle tone is created when the pen is viewed from varying angles. Once again precision is paramount, if these lines vary in depth, width or for that matter in angular position by any significant amount then the effect will not be a desirable one, tonal continuity will have been destroyed." 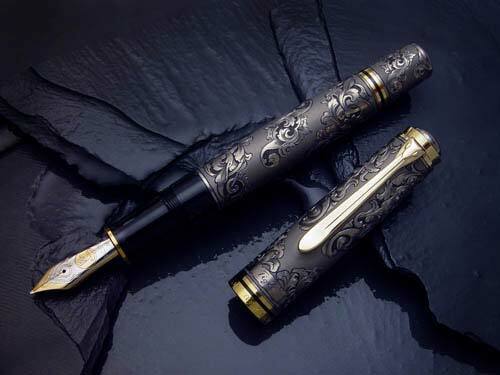 "The hand engraved pen will harness the reflective properties of the base metal dependent on the specific angled cuts, depth and graduated widths created by the artist. Therefore we are now speaking of individual characteristics deployed by each specific artist's signature style." "An additional accent on the 'Monarch' is its satin gray finish. At first glance it appears as a quick and simple process. However, the more complex the design, the more time and effort is required in the masking process (temporarily blocking off the engraved areas). As with any exhibition grade engraving, each step must be achieved first time around. There is no margin for error, making the entire process a very slow precision-based endeavor." 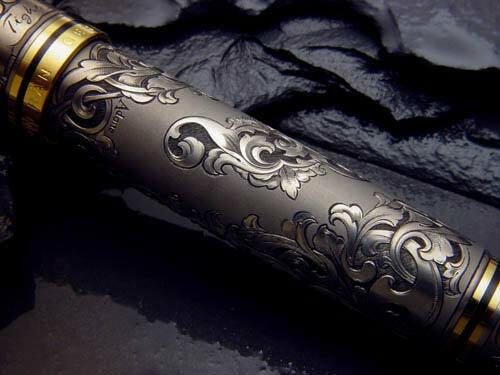 The engraving work on this pen required 180 hours to complete. That's in addition to the time required to turn down the cap and barrel, and fit the overlay sleeve to the pen! With a work of art like this, it is appropriate to call it a labor of love. I can think of no other term that sums up this pen! We'd like to thank both Grayson Tighe and Adone Pozzobon for making the pen available for photography, and for sharing the background behind it's creation.